Mr Comey has to remain optimistic in order to survive the consequences of his own original sin - EMAILZ!!! I share your pessimism, Owen. Today's mid-terms will be a real indicator of whether there is any basis for Comey's optimism. I'm leery of Comey and his post-firing Boy Scout routine. 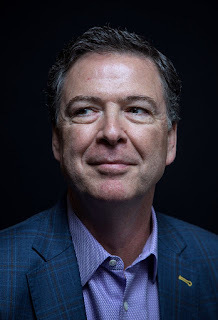 Well-intentioned or not, the email stunt he pulled on Hillary in the shadow of voting day two years ago, has left a lasting bruise on Comey's credibility. I wonder if what he did keeps him awake at night, Cap. Americans like to think they're on the side of progress, Lorne. But I wouldn't call the last two years progress. I have to wonder if what Comey writes is an attempt to make amends, Mound. He has a lot to answer for. Workers elected Trump, not Comey. Back then they took a gamble on Trump because he came across as a con man - at least, that's how he was portrayed in the MSM. But then he destroyed free-trade globalization and replaced it with fair managed trade - which has been the labor position for decades. Are workers going to abandon Trump after delivering the impossible? I find that hard to believe. My bet is that the polls are just as wrong now as they were 2 years ago. What are the Democrats running on again? Americans are evil racists? Nancy Pelosi is even more incompetent than HRC! Let's hope the Democrats rebuild the party from the ashes better than the federal Liberals under Trudeau. Whitewash isn't going to cut it anymore. It's true that the Democrats helped to put themselves in their post Trump position, C.C. But Trump Unbound is a very dangerous fellow. He needs to be checked -- something the Republicans aren't willing to do. I would say Trudeau is the dangerous fellow. He wants to export 3-trillion barrels of bitumen to China and then pretend he's a champion of the environment. He supports bad trade deals that bleed wealth and jobs, and make global environmental regulations an impossibility. But now they can no longer just obstruct. They are now in the government. Now they have to WORK WITH TRUMP and get legislating! So this is an incredible opportunity for Democrats, Trump and Americans – and Canadians. I hope some leader with some sense steps forward in the Democrat party. What they got now is a clown show. I think you're way too optimidtic about the Democrats working wwith Trump, CC. If anything, the nation is more divided than it was before the election.